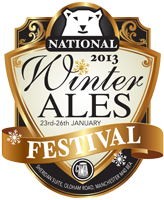 I really enjoyed visiting the National Winter Ales Festival last year but I wasn't able to go on trade day (the Wednesday) and so went at the weekend. By the time I got there most of the stuff I wanted to try was gone but it was still an excellent festival. This year I was invited by Thwaites to come for the trade afternoon and so jumped at the chance for a ticket! The afternoon was booked off work, the train caught from Burscough Bridge on the direct train to Manchester Piccadilly and then a brisk walk planted me in The Marble Arch to meet a few other festival goers and to get a quick pint (of Pint) in before we caught the bus up to the venue. Doors opened promptly at 2:30 and through good queue management a glass was in hand pretty quickly so off to choose my first beer before meeting Ian Bearpark, Brewery & Distribution Director for Thwaites at 3pm. I headed straight to RedWillow's section and chose a half of Heartless, a lovely smooth stout with a good chocolate edge to it. 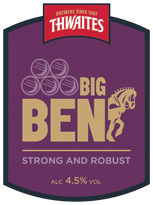 Big Ben - 4.5% brown ale (used to be called Shuttle) a solid brown ale but brewed to be less sweet than Newcastle Brown Ale. It was a very sessionable beer, dark amber in colour which was quite light in it's taste and body but had some nice caramel and fruity notes to it. 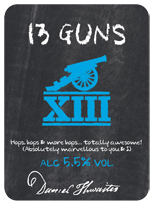 13 Guns - 5.5% American IPA, to quote Ian he "chucked it all in" (with regards to the generous use of American hops). This beer was quite something and I can see why it got so much talk at GBBF. Ian mentioned that he is a massive fan of Stone beers and you can kind of see that when you try 13 Guns - it was a rich copper colour with a big citrus hoppy resinous quality to it. It also had that chewy aspect that you sometimes get with big malty but hoppy ales and had a wonderful sticky resinous finish. I don't often get the chance to drink IPAs on cask (it's normally bottles at home) so it was great to try such a beast of a beer. Thwaites have gone down the route of a lot of large breweries at the moment, they have installed a mini-brewery inside the brewery to be able to experiment with some of these more adventurous ales, they have a 20 barrel brewery to 'play on' compared to their normal 360 barrel one. 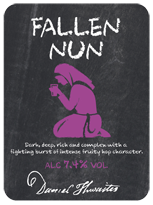 It's really encouraging to see a national brewery like Thwaites producing stuff like 13 Guns and Fallen Nun, they are excellent beers that I would buy again and again, it just shows that the big boys can do 'craft' as long as they are allowed to do so. After finishing up with Ian I managed to spend a short while with Mike from Okells Brewery who showed me their new branding on the pumpclips and talked me through two of their new beers, Olaf - a nice low ABV roasty stout and MPA (Manx Pale Ale) which was a lovely citrusy ale. Then I generally milled about meeting folk (Chris Dixon, Jay Krause & a lovely lady from Port Street Beer House to name but a few) and supping quality beers until my internal beer-spidy sense told me it was time to go home!